Since it is so likely that they will meet cruel enemies, let them at least have heard of brave knights and heroic courage. In a profound way, she was right. Fairy tales are but one chapter in the book we call storytelling. We may prefer reading other kinds of stories (mystery, science fiction, and so on). Still, no matter what kinds of books we enjoy reading there is a common printing press in the room of our minds where all these treasures originate, the imagination. And if fairy tales are but one chapter, storytelling is but one volume in the vast library of man’s imagination, albeit an essential one. Although, God’s gift of the imagination is more than a storehouse; it is also a lively workshop of creativity. Man is a storytelling creature. From the time we wake up in the morning to the end of the day, stories fill the pages of our daily lives and bind us together like a cover and spine of a well-crafted book. We write, create, and use God’s gift of the imagination because God made us in His image; He is the Author, Creator, and Chief Imagineer. As Tolkien once wrote, “We make still by the law in which we are made.” Storytelling is imprinted on our minds so deeply because God Himself is the supreme Story Teller. From the first words of Genesis – “In the beginning” – to the closing words of Revelation – “I AM the Alpha and the Omega” – Scripture is one story after another. God speaks and we listen, read, mark, learn, and inwardly digest. Adam and Eve were created in Paradise and banished from Eden, yet given a promise. Abraham was shown the starry night and given a promise that from his offspring would come the Savior. John the wild, unkempt wilderness prophet became the forerunner of Jesus, the promised Messiah. Peter, James, and John; Mary, Mary Magdalene, and Martha—all were eyewitnesses of this great story: God’s promise came true. And there are many other stories, all with a common theme and singular focus: God’s promises for you in Jesus. After all, Scripture is not only full of innumerable stories, but one grand story, the greatest story of all: Jesus crucified and risen for you. Every book, chapter, and verse of Scripture points to Jesus crucified for you. Now, of course, even the best fairy tales are unlike these Scriptural stories because Adam and Eve, Abraham, Moses, Peter, Paul, Mary, Martha, Jesus and all the rest are historical figures whose stories are reliable, verifiable, and trustworthy in time and history. But the best of man’s stories are like God’s stories in this way: they point to something outside of their own pages, characters, and story to the greatest story of all. Like a shattered mirror that can still give you a glimpse of your reflection, many of the works of man’s imagination also contain glimpses or reflections of the great story of Jesus crucified and risen for you. God’s gift of imagination brings a story, like The Lion, the Witch, and the Wardrobe or The Lord of the Rings, to life. God’s gift of the imagination is given for many things: teaching, delight, and beauty, just to name a few. God’s gift of the imagination is what Tolkien called the work of sub-creation, but it also can be for proclamation. God’s gift of the imagination can also be used in service of telling the greatest story of all, the Gospel. Christians are called to tell that story to others, to give a reason for the hope that is within us (1 Peter 3:15). Logical arguments and historical proofs may work for many as we declare and defend the Christian faith, but not all. We often find ourselves in need of another book on the shelf. I suggest picking up a good fairy tale. 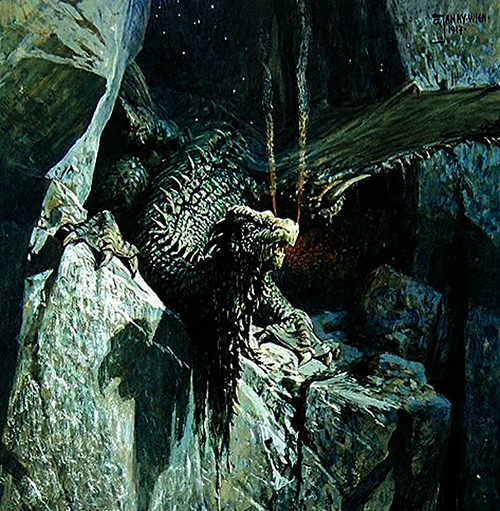 Stories have an excellent way of “stealing past watchful dragons”, as Lewis once wrote. Think of Harry Potter and Hermione Granger standing beside his parents’ tombstone in the graveyard at Godric’s Hollow. It’s Christmas Eve. Inside the church nearby they are singing Christmas carols. And on that headstone they read the inscription: The last enemy to be destroyed is death (1 Cor 15). Samwise was right. The best stories give us something to hold on to. Through the darkness of Mordor an incorruptible, precious hope breaks through and casts out the darkness: Jesus crucified for you. The inscription on the Potters’ grave in the world of Harry Potter points to an empty tomb in our world, where the last enemy of death was destroyed. Christ is risen for you. And Aslan is known by another name in our world: Jesus, the Lion of the Tribe of Judah, who has conquered sin and death for you, for real, forever. Yes, my daughter is right. Fairy tales are real. C.S. Lewis, On Three Ways of Writing for Children. Of Other Worlds: Essays and Stories. New York: Harvest Book. 1966, p. 31. J.R.R. Tolkien, Mythopoeia. Tree and Leaf. London: HarperCollins Publisher, 2001, p. 87. C.S. Lewis, The Voyage of the Dawn Treader. New York: Harper Trophy, 2000, p. 247.